Beyond the basics: 6 strategies to boost both the value and success of your resume to get it read! A resume has one primary purpose: to secure interviews. So how can you create a strong resume that garners attention from hiring personnel and gets your foot in the door? Human readers and computer screeners are both used to dissect and analyze resumes, yet both qualify content uniquely. Applicant Tracking Systems (or ATS) are used by most major organizations to screen out candidates who lack required job skills. These systems can be tricky to ‘overcome’ if your resume is not ATS-compliant. HR personnel and recruiters also use a discerning eye to critique resumes in order to select interview candidates. So what exactly are human and computer readers searching for? According to a recent analysis of 4000 job applications by TalentWorks, there are 13 key factors that drove up interview rates of applicants. Tips included: “Describe your job achievements with different action verbs. This one resume tip is associated with +139.6% boost in getting more interviews”. Recognize that resumes are not just meant for online applications. That’s right, diversify job search tactics to increase resume success. Job boards offer a much lower ROI because you are competing with the masses. Referrals and networking are rising as the top job search strategies. According to a study by Jobvite: “Job boards have a .4% effectiveness and employee referrals have 5.2% effectiveness”. If you want resume tips straight from the horse’s mouth, align yourself with experts who know resumes and job search strategies the best. Your friends, parents, and colleagues may have lots of opinions to share, but unqualified advice can be more harmful than helpful. A great starting point is to follow resume thought leaders (career coaches, resume writers, and HR personnel) on social media who have their finger on the pulse of resume development and best practices. Seeking resources to help? Consider these Top 15 Job Search Experts to Follow on LinkedIn for regular tips on all aspects of the job search (myself included). You can’t expect to stand out in a stack of resumes that all look the same. While considering the unique needs of each audience, employ design tactics to guide the reader’s eye and draw attention to important impacts. 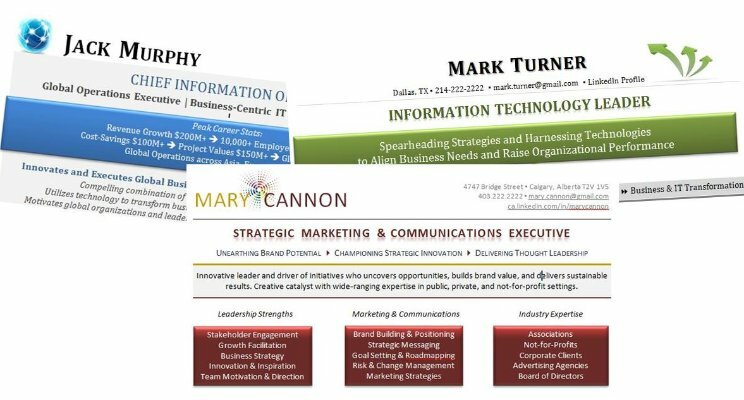 Visual resumes are written for people, not machines, so save your design resume for modern job search tactics like referrals and networking (not online applications). What do recruiters think about the actual look of a resume? On the flip side: a resume that looks old-fashioned, generic, or is just plain difficult to read won’t instill a lot of confidence in the reader. An outdated resume makes you look just that – outdated. I hear time and time again from recruiters and HR folks that job seekers are bypassing critical job application instructions, getting themselves screened out of the hiring process. If you want your resume and job application to be taken seriously – and be read – you need to comply with application requests and guidelines. If a cover letter is requested with the resume: include one! Even better, customize it! If a copy of your resume is requested to be submitted in Word (versus PDF): do it! The system may not be able to read other formats. Applying for jobs online is one of the most challenging, and often least successful, ways of getting a resume noticed and read. To enhance the chances of your resume making it in front of person, deliver it directly. This means bypassing the system as much as possible, building and leveraging relationships, capitalizing on referrals, and locating decision maker’s names. Engage your community, connections, and friends to get your resume into the right hands. Let everyone know who you are, what your value is, and what you are looking for. Also, research and pursue right-fit opportunities, companies of interest, and referral opportunities. JobVite’s 2018 Job Seeker Nation Study further stresses the value of relationships in the job search, noting that: “Friends are the job seeking jackpot”. By leveraging the 6 insights, tips, resources, and recommendations above you can boost both the value and success of your resume, ensuring it resonates and gets read!